Especially useful for people working with teens/tweens and playing games like Pictionary, Win Lose or Draw, and Charades. Just click the button to get a new word, and you can choose categories like easy, medium, hard, really hard, movies, idioms, people and characters, or a mix of all categories. I know this just saved me at least 15-20 minutes of staring off into space trying to think of words! The blog it comes from has TONS of great group game ideas too--all my favorite kinds of games. You know how sometimes when you imagine something or come up with an idea, reality is not quite on par with your imagination? My Teen Angry Birds program was the EXACT OPPOSITE of that! 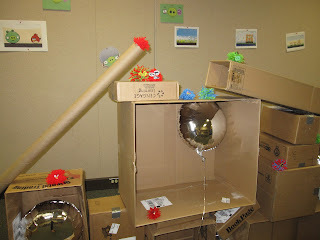 I imagined using cardboard boxes to create life-sized structures to topple and helium balloons (for the pigs--if they float free then the pig was destroyed). The dollar store was out of green so we used silver (I was going to tape pig pictures on, but even small pieces of paper were too heavy). 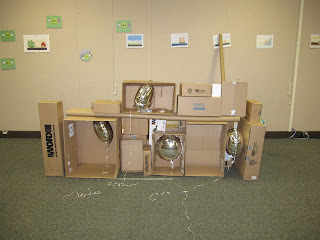 We had plenty of room, so we used playground balls and threw them to knock down the structures. 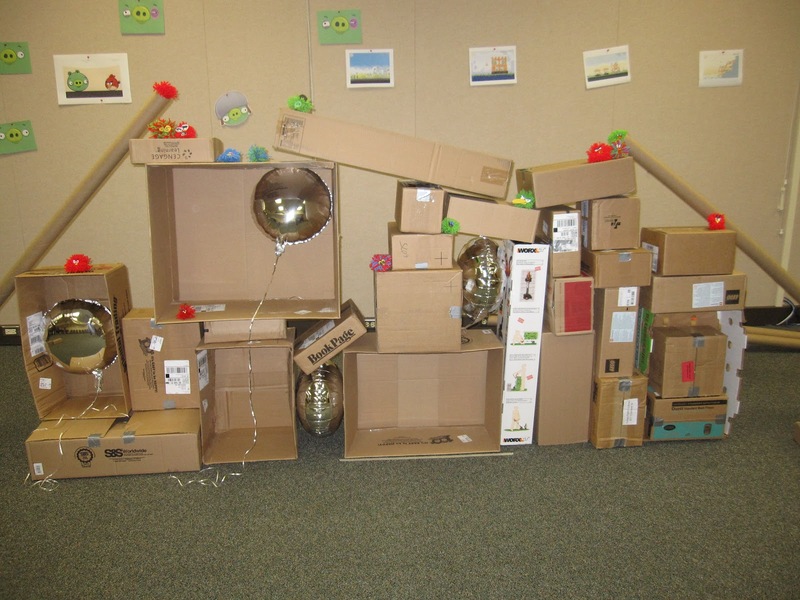 ﻿﻿ Each teen took a turn building, and another teen got three chances to knock it down and then it was his/her turn to build. We did one round like this, and then they did a team round where they split into two groups and competed to see who could knock down the other team's tower in less throws. The only thing I would change is to have more large boxes--I had TONS of smaller sized ones, but the balloons wouldn't fit. We also made our own angry birds by making yarn pom-poms and gluing paper faces to them. The teens LOVED this (paired with snack time, of course!). 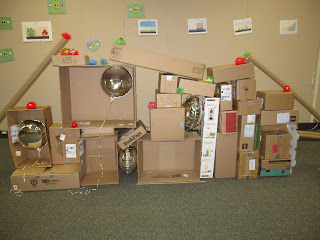 Check out the GIANT cardboard tubes I found! We made a giant photo-op structure and decorated it with all the birds and pigs the teens made. 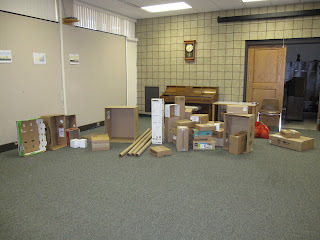 Finally, our last activity (and this was pretty much unnecessary) was another type of structure to knock down. We used Dixie cups and (shamrock themed) stress balls that I got on clearance. Sharpies worked perfectly to transform them into pigs, and I let each of the teens keep one at the end of the night. 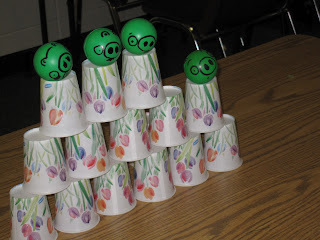 There was pretty much only one or two ways to stack the cups, and it was HARD to aim and knock them down. 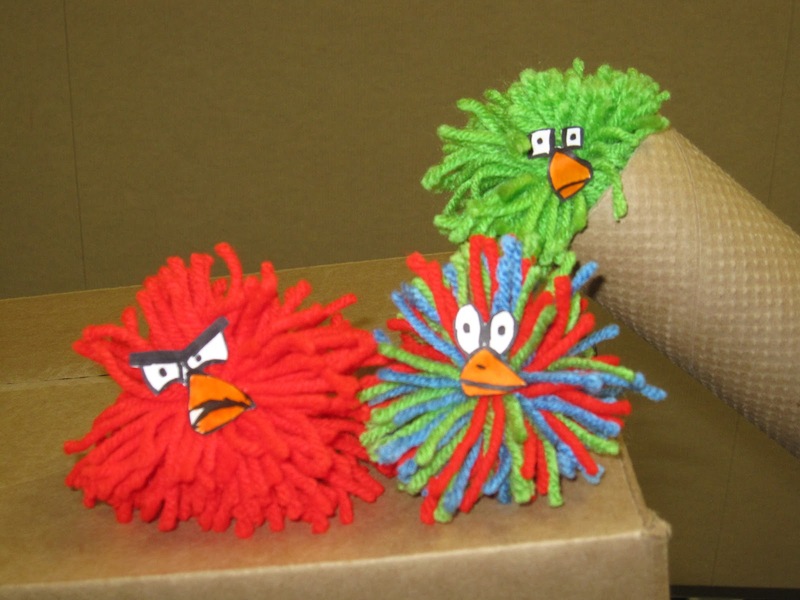 We used the pom-pom birds that the teens had made, and flung them with a large kitchen spoon. I would probably just skip this in the future. This was a very inexpensive program and it was FUN. I did start saving boxes a couple of months beforehand. I only bought yarn, snacks, balloons, and the stress balls.